The statue depicts a World War II-era paratrooper with one foot propped on a pile of rocks and holding a Thompson submachine gun. It was originally proposed by Lt. General Robert Sink as a tribute to airborne soldiers. The 15 feet tall bronze statue stands on a pink marble base four feet tall, eight feet wide and fifteen feet long. This statue is a replica of one created in 1961 made of polyester and steel. The original was restored and installed at the Airborne and Special Operations Museum in downtown Fayetteville in 2011. The plaques on the base appear to be original to the 1961 statue as the smaller of the two describe the sculptor and builder of the original. Maj. General Virgil L. Packett II, commander of the 18th Airborne Corps and Ft. Bragg was host to the dedication of the new Iron Mike. 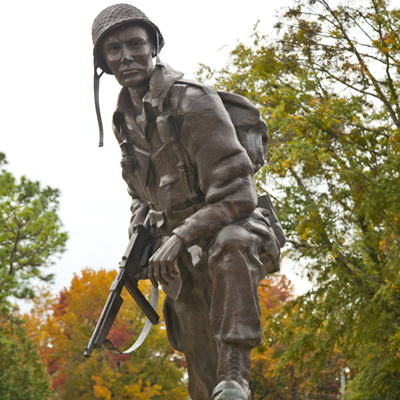 Packett said the statue symbolized the spirit of the Airborne and service to the country. He also noted that Iron Mike carries the posture of a paratrooper who appears to have had a long day. Also present was retired Sgt. Maj. James L. Runyon the model for the statue in 1960 and Dennis Hiebert son of the sculptor, Leah Hiebert. The sculptor, Leah Hiebert was the wife of the deputy post chaplain Samuel L. Hiebert. She studied painting and sculpture in Japan, Germany, Holland and the United States. In 1947 she became the first western female to have a solo show in Korea. She had four of her sculptures in the Tokyo Metropolitan Museum of Art, the first American Woman so honored. She wrote three books, one an autobiography titled 50 Journeys (1982) and one titled The Making of Iron Mike (2006) published when she was 96. Sgt. Major James L. Runyon dressed in World War II uniform and combat equipment modeled for the statue. He was intended by General Sink to resemble the artwork from the cover of Ross Carter’s book Those Devil’s in Baggy Pants. Continuum Digital of Orlando Florida created a 3-D map of the original 1961 statue and used that to create a foam model. That model was sent to Bronze Services in Colorado for casting. The statue is located on Fort Bragg military post in the traffic circle at Randolph and Armistead Street. Access to base without a military or Department of Defense identification is possible by requesting a temporary pass and having a background check performed at the Visitor Center located on All American Freeway. Photography is not permitted on base without permission of the Public Affairs Office. The 1961 statue was moved from its original location at the Knox Street entrance of Ft. Bragg to its second location on Randolph Street in 1979. It had become a common target for vandals and anti-war protesters and was moved for its protection.